First, I apologize for these pictures, there is a lot of glare. I was rushing to take these pictures before work this morning. I LOVE old lace! 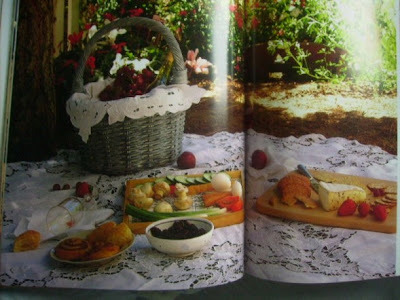 The photos are all from the book Living with Lace by Bo Niles. 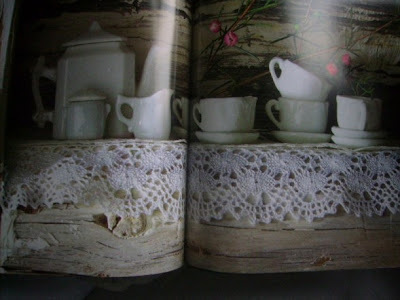 I found a really beautiful website yesterday which inspired this post about lace. Em's Heart Antique Linens. I found it through someone's blog....sorry I don't remember who it was??? Wow, I have never seen so many beautiful things! Next thing I know I'm on Ebay looking for more linen and lace and I don't know how this happened but I bid on a tablecloth and napkin set! I went to bed last night hoping that someone would outbid me because I have no business spending money right now on that kind of stuff! I woke up this morning and I was relieved someone did outbid me. I really need to have more restraint! Update on the little table I posted about a couple days ago. I waited a couple days before I went back in and it was gone. I don't know why but it made me feel a little better that others have had the same experience of regret for not buying something. Thanks for leaving those comments! I've learned my lesson and if I see something that I love that much again, I'll just buy it! Top Ramen is not that bad and I could eat that for a week in exchange for a beautiful table...maybe not all the time but once in awhile! I don't think my daughter would feel the same way though. I hope everyone has a great weekend. I may hit a couple garage sales tomorrow to see what treasures I can buy with about $10. Update: I was JOKING about eating Top Ramen...my finances aren't quite that tight and in 2 months my car will be paid off so I promise I'll stop acting like I'm dirt poor when really I'm not. Cindy my heart skipped a beat when I was looking at Ems Linens too! 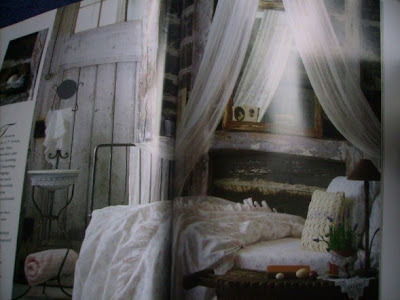 I love to be surrounded with vintage linens and laces..they are soooo pretty! I have the lace book too!The pictures are excuisit! 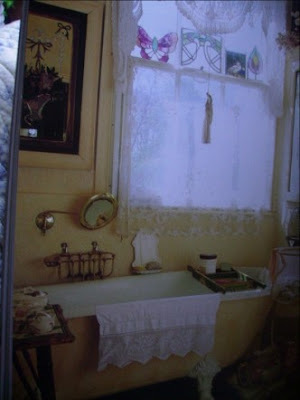 It was my dear friend Heathers blog that you read about Ems Vintage linens! Very pretty pictures. I especially like the bathtub ones. Ramen is so unhealthy - I don't really think you'd want to live on that for a week! 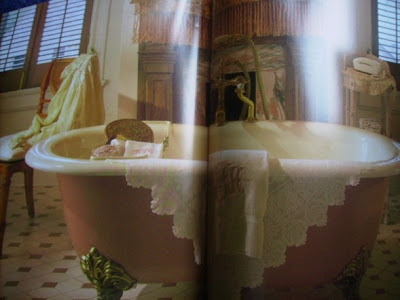 I love the bath room pictures too. That would be so relaxing a glass of wine and a bubble bath! I've found a tomato sandwich great when I was a little short of cash. If you toast the bread it's a feast ha ha. I can relate. Also, keep an eye out at the thrift stores for linens. I have lots of linen and old lace I've picked so cheap. Enjoy the hunt this weekend. That's a great site, isn't it? She has some amazing pieces. I'm in process of having some of my lace framed for a slightly different twist. Have a great weekend! Kathy, funny you should mention tomato sandwiches....that's one of my favorite things to eat. LOVE THEM. I like soft white bread, mayo, good tomato and salt & pepper. Great pictures!! I took a hop to Ems and wow beautiful linens and lace. Have fun this weekend. I can hardly wait to see what you buy. So pretty!! I love old lace. You are so funny. I love reading your blog. 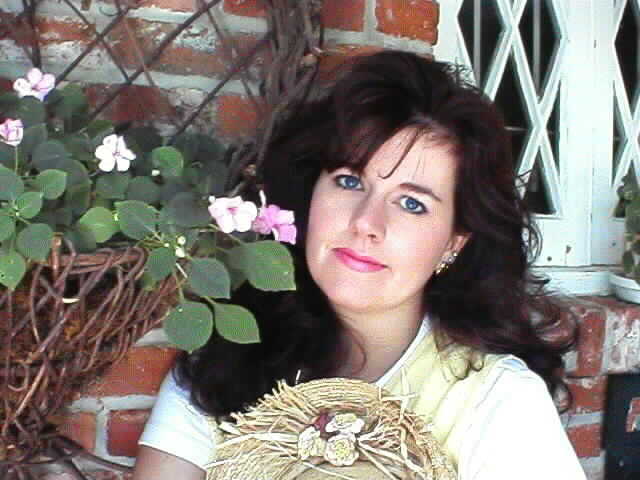 I love lace and have a collection of antique lace that my Mom left me. I'll have to post pictures of it one of these days. Aren't Bo's books just wonderful? There are so many delicious decor books out there and I drool over each new one. Have a sweet weekend dear Cindy! That book looks amazing. I have a box of lace that my GrandMother made. I have only used a tiny portion of it for lack of ideas. Thanks for sharing the book. Hello Cindy~ My grandma told me many times in her broken Austrian accent, "Never love something that cannot love you back." And she should know, since she had to leave so much when she came to this country to start a new life. That perspective has helped me when I've been frustrated in decorating with very little $cash$. I do like the way you write about REAL emotions in your blog....and dealing with normal everyday things such as being short on $$$.....it's like visiting a good friend. Isn't it fun to live with and use your great "finds" as they become part of your everyday? Thanks for your fun blog. I'm not sure when I got that book or why, but I'm sure someone posted about it. Maybe you! Right now handmade lace is a bit of an obbession with me. The beauty just captures me. I have to stop buying it though! That's a wonderful picture of your son in the last post. A truly kind hearted post as well. Cindy, I am so glad you'll have your car paid off in a couple of months!! You can do some serious Thrifting then! Your home is so lovely, as is your blog. I check it almost every day! Hi Cindy! I just love your posts and the pictures are always so very pretty. 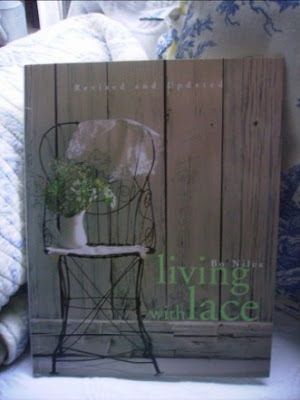 I've had that book "Living with Lace" by Bo Niles for many years and the pics inside are exquisite!! Such inspiration too. Also love your story about the picture frame with your son's pic. Seems you've had some rather interesting times!! Gorgeous - as usual! Speaking of car payments...congratulations on being so close to being free of them. I haven't had one in years and I just get all wonky thinking about one again! ICK! I have to get that book. Every picture was prettier than the one before it. I love your inspiration Fridays - you always find something really amazing to share. What fun it would be to follow you around for a week! lol Love the photos and I'm off to check out that website on linens, thanks! I LOVE lace...and these are lovely!!!!!!! That's a book I must add to my collection! Thanks for sharing! I love the photos you chose to share! I have the book also, and I love to sit and get inspired looking at it.